Forgive our beginning with a textbook-sounding definition. It seems that we need one to anchor our forthcoming pronouncements involving the term “Earth change.” We need a measure of precision in our usage so that we don't lose our way. And so, here is our definition. Earth change. Any historically unprecedented geophysical event that is observed to occur in the Earth's solid, liquid, and/or gaseous realms, and which fits into the scenario of forthcoming changes to our planet as predicted in the psychic readings of Edgar Cayce. Just what does our scenario of forthcoming Earth changes look like? As indicated in the first part of the scenario described on pages 210-211 of our new book, we have to begin with an upheaval in the interior of the Earth in 1936. Imagine that we have been transported in time to 2200 A.D. We are attending a lecture by a geologist who is reporting on the pole-shift and Earth-change events that took place starting 200 years earlier. Here are the principal events that he says occurred in those days. Note that the lecturer has no problem mixing what we recognize as Cayce predictions with factual data collected by the scientific community of the 23rd century. A "catastrophe of outside forces" affected the Earth in 1936. The outside forces engendered upheavals in the interior of the Earth that caused the rotational axis of the independently spinning core to shift slightly. Over the next 65 years, there developed a sufficiently-altered distribution of masses at the core-mantle boundary, and (or) in Earth's lower mantle, to prime the Earth's upper layers for a slip of the mantle and crust over the fluid outer core, or over a weak layer deep in the mantle. Toward the end of this 65-year period, increasing mantle/crustal "upheavals" began to be observed in the arctic, over the sea floor around Antarctica, and in the torrid areas paralleling the equator. These upheavals reflected the deep-Earth mass imbalances that were then tending to seek a new configuration with respect to the imperative of our planet's centrifugal forces. As the mass-imbalance trigger-mechanism slowly expressed itself, sensitive volcanoes in Earth's torrid areas began to erupt, reflecting the pressure changes that were beginning to start the crust and mantle slipping over the equatorial bulge of Earth's outer core. The 58.0°W meridian became the pole-shift meridian, because for roughly the prior century, the North Pole had been moving down this meridian toward Sidney, Nova Scotia. As Earth's mantle and crust slipped southward over the deep weak layer, along the 122.0°E limb of the shift meridian, the north and south poles and Earth's equator all moved in the opposite direction; that is, the piercing points of the Earth's independently spinning axis of rotation seemed to move, in response to the actual slip of the crust and mantle in the opposite direction. The same motion held for the maximum motion and direction of the equator. Initial manifestations of the shifting poles involved lowering of sea levels and draining of former lowlands in two of Earth's quadrants. Rising sea levels flooded former land areas in the other two quadrants. All the while, tsunamis and sloshing ocean waters moved back and forth across the ocean basins. So where do the Sumatra events of the week of December 26, 2004, fit into the above scenario? We suggest they fit in at paragraph 4 above. If so, this means that there are lots more such events to come worldwide as we get closer to the predicted pole shift. In our subscriber's bulletin of January 5, 2004, we find quoted the statement of CalTech's geology professor, Dr. Kerry Sieh, to the effect that another Sumatra-type quake could be on the way. "There is some evidence that the stresses on the tectonic plates south of the epicenter [of the great M9.0 Sumatra quake] may now have increased and raised the chances of another major earthquake," he said. As for more great tsunamis coming as we approach and enter the pole shift, recall this passage from the New International Version of the Bible (Luke 21). It is found under the heading. "Signs of the End of the Age:"
There will be signs in the sun, moon, and stars. On the Earth, nations will be in anguish and perplexity at the roaring and tossing of the sea. Men will faint from terror, apprehensive of what is coming on the world, for the heavenly bodies will be shaken. At that time they will see the Son of Man coming in a cloud with power and great glory. When these things begin to take place, stand up and lift up your heads, because your redemption is drawing near. Tsunamis cause the sea to begin "tossing" when they mound up over the shallow continental shelf as they move toward shore. And they often display "roaring" when they begin to overtop the coastline itself. Regardless of the final outcome of the analysts' investigations, we think that a good case can be made for the Sumatra catastrophe to be designated an “Earth change,” according to the definition given at the beginning of this article. A Sumatra mega-thrust earthquake, like the one that just occurred, has not occurred with this extreme magnitude, in this region, within historic times. About 1,200 km (750 miles) of the fault line shifted about 15 m (50 ft). Professor Hideo Matsutomi, who led the Japanese team investigating the tsuanmi said, "There have been six major tsunami in this region since 1797, but I think this last tsunami was the biggest." Writing in Eos (4 Jan 2005), E. Bernard, a world recognized tsunami expert said, “to our knowledge the Sumatra tsunami is the first global tsunami.” He also said, “The tsunami community is in awe of the magnitude of this event,” and that “measurements of the tsunami so far from its source provide an indication of the amount of energy that the earthquake... placed into the ocean.” He anticipates that it also may have been recorded in the Atlantic Ocean. This makes it an unprecedented event. Next Catastrophic Geophysical Event Coming Out of Sumatra? How might the Sun be darkened? In chapters 2 and 3 of our new book, “Earth's Catastrophic Past and Future,” we conjectured that -- as with past eruptions of torrid-area volcanoes in Indonesia – mighty eruptions there could spew so much ash into the upper atmosphere that the Sun could be darkened. This prompts the question, which volcanoes on Sumatra might yet be stirred into action by the great thrust earthquake? Our best candidate is Mt. Toba, in northern Sumatra. It has a notorious reputation for darkening the Sun. It is the super-eruptive volcano closest to the epicenter of the great M9.0 earthquake. 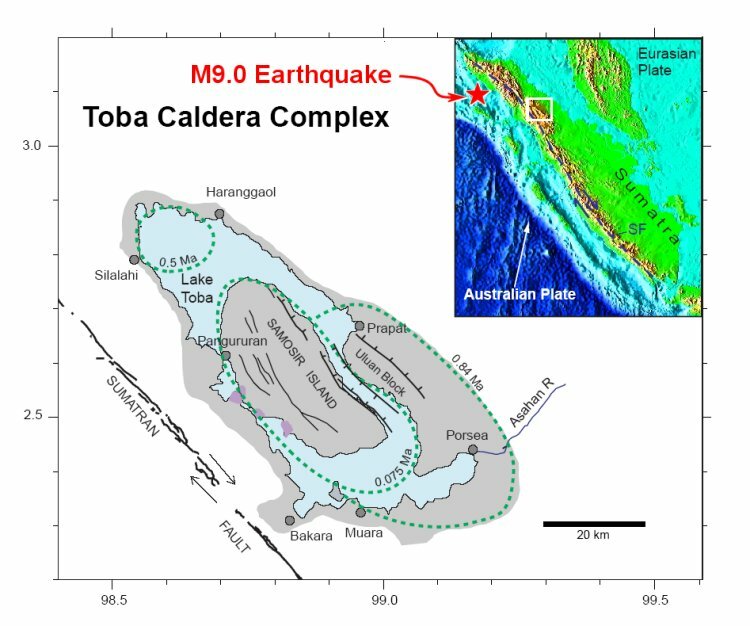 The Toba caldera lies only 210 statute miles (339 km) from the epicenter of the December 26 quake. For the purposes of our search for volcanoes that could one day "darken the Sun," we will define super volcanoes as those which by their past activity have erupted with a volcanic explosivity index (VEI) of 6 or more. The Yellowstone caldera eruption about 600,000 years ago reached 8 on the VEI scale. (Each integer on the rising VEI scale indicates that 10 times the amount of material is ejected relative to the previous, lower integer.) The Yellowstone VEI of 8 was the highest ever computed, Tambora's (1815) VEI was 7, and Krakatau (1883) had a VEI of 6. But Toba's last super-eruption had a VEI of 8+. Super-volcano eruptions are driven by huge pools of viscous lava (magma) containing abundant trapped gases. After undergoing strong eruptive activity they produce calderas (large basin-shaped depressions). Toba has been essentially dormant since its last eruption about 74,000 years ago. At that time it blew 670 cubic miles of ash into the air, or about 3,000 times as much as Mt. St. Helens in 1980. The eruption buried most of India under ash. Sunlight was so diminished that, at the end of the first six years of climate cooling, a thousand-year ice age began. Perhaps only a few thousand people survived worldwide, living in pockets in Africa, Europe, and Asia. The figure below shows the dimensions of the Toba beast and its proximity to the epicenter of the great Sumatra earthquake. This figure shows the distribution of magma beneath the Toba caldera complex, north Sumatra Indonesia. It is modified slightly from Figure 1 of Masturyono, and others, 2001, Geocem., Geophys., and Geosystems, v. 2, April 16, 2001, as modified from Knight, et al. . The gray areas show land within the present-day topographic depression. Dashed green lines show approximate source-caldera outlines for each of three Toba tuffs [ash deposits] that were erupted about 1 million, 840,000, and 74,000 years ago. Areas of recent uplift are shown by purple shading. The white box in the inset outlines the study area. A star denotes the location of the epicenter of the great M9.0 earthquake. Now THC is not saying that Toba will be erupting soon with a repeat performance. We don't even have any certainty as to the mechanism by which the Sun might be darkened. But as one possible cause, we might want to consider the possibility of Toba producing some sort of super eruption. A geologist would protest. “Has there been enough time for Toba's magma to be charged with sufficient dissolved gas for a new eruption to produce enormous quantities of ash?” he might ask. The questions are many. The answers are few. We await the next shoe to drop, however, using our scenario as guide to the season of Earth changes that our planet seems to be entering. Since first posting this article, two additional studies have been completed that add further support to our assertion that the Sumatra event was indeed an Earth change, of the type predicted to be occurring in this post-1998 period in Cayce readings 3976-15 and 1152-11. The earthquake occurred 20 miles below the sea floor where the Indo-Australian plate is colliding with the Eurasian plate. Movements of a few tens of yards of the seabed along the subduction zone of 750 miles created the pressure wave in the water column that became the tsunami. The map of the seabed, displayed yesterday at the UK Hydrographic Office in Taunton, Somerset, showed the Indo-Australian plate - marked in deep purple - sliding under the Eurasian plate, causing the latter plate to bunch up to more shallow depths marked from blue, then green, yellow and red (most shallow). The maps clearly show the boundary between the deep, flat Indo-Australian plate, and the heavily deformed edge of the Eurasian plate. Scott's commanding officer Steve Malcolm likened distortion to "the crumpling up of a carpet". The collision forced up spectacular large thrust ridges, almost a mile high. These unstable blocks have collapsed in places, producing large landslides several miles across. 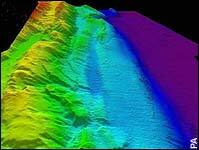 The survey also found a large landslide block some 300ft high and 1¼ miles long, and a diverted canyon. Commander Malcolm said features appeared to be those of "an absolutely enormous event in global terms". The earthquake that created the devastating Asian tsunami on 26 December 2004 was three times more powerful than first thought, say researchers analysing long-period seismic waves. The finding could upgrade the quake to the second strongest ever recorded and explain why the tsunami caused such great damage across the ocean in Sri Lanka and India. Earthquakes are classified on the Richter scale by their largest-amplitude seismic wave. These seismic waves come in a variety of periods, or wavelengths - but only the most powerful quakes pack a lot of energy into long-period waves. 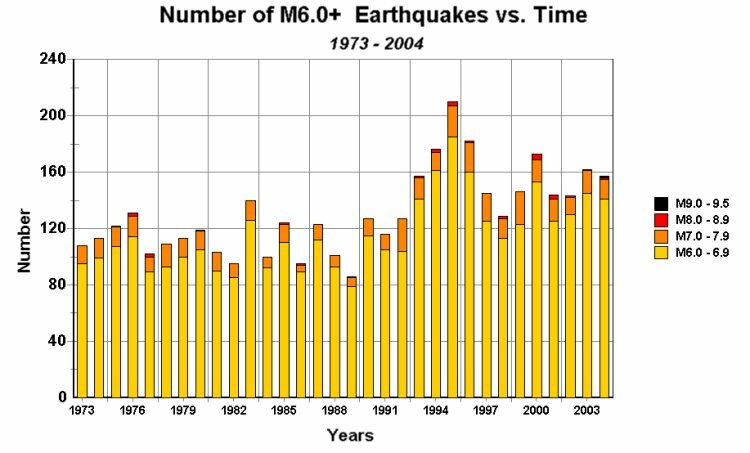 Seismologists initially used seismic waves with periods of about 300 seconds to set the magnitude of the Sumatran earthquake at 9.0 - making it the fifth most powerful event on record. Now, seismologists Seth Stein and Emile Okal at Northwestern University in Evanston, Illinois, US, have scrutinised seismograms taken from 7 stations around the world in the week or so following the earthquake. They looked for the longest-period waves possible - those lasting about 3200 seconds (53 minutes). "We found, to our surprise, that there was three times more energy out there than at the 300-second period," Stein told New Scientist. "It was colossal." The new work reclassifies the earthquake on the logarithmic Richter scale at magnitude 9.3 - second only to the 9.5-magnitude quake recorded in Chile in 1960. The Asian earthquake occurred at the eastern edge of the Indian Ocean where, over millions of years, the Indian tectonic plate has been disappearing beneath the Burma plate. This "subduction" zone had been locked for perhaps 200 years before the built-up pressure was finally released in the slippage of 26 December. The Burma plate rebounded upwards by about 10 metres at the quake's epicentre - setting the deadly tsunami waves in motion. And the process continued along the border between the two plates, causing the earth to rupture along the fault line - running from south to north. But seismologists are not sure exactly where the rip stopped. Some think the rupture only made it through the southern third of the 1200-kilometre-long zone that was rocked by aftershocks. "But if the earthquake is three times more powerful then previously believed, that's telling you the fault area is three times bigger," says Stein. "We think the entire aftershock zone ruptured." 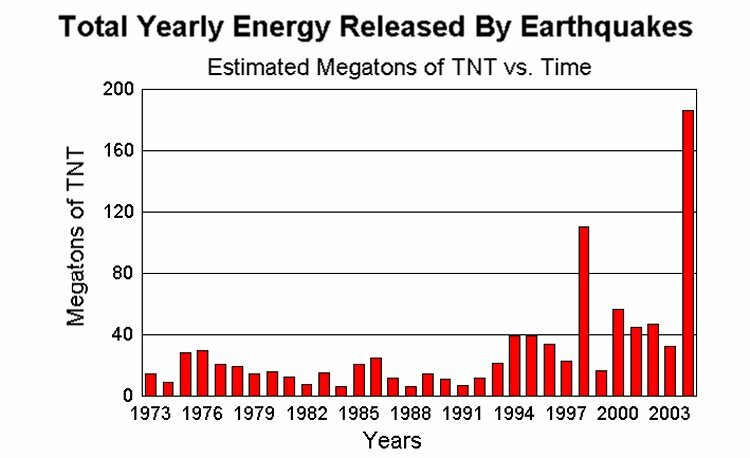 The northern two-thirds of the zone may have taken longer to slip, which is why its energy was released in longer-period waves. But he warns that smaller earthquakes could still occur, perhaps spawning localised tsunamis. Furthermore, other locked sections of the fault - further to the south, near Java, for example - could still rupture catastrophically. If the rupture did indeed occur along the whole length of the aftershock zone, it could explain why some distant regions were so devastated by the tsunami. While the lower third of the zone directed tsunami waves to the southwest, the upper portion has a different orientation and sent waves due west - straight towards hard-hit Sri Lanka and southern India. However, other factors, such as the topography of the sea floor, may also explain why the waves gathered so much force in those regions. Other seismologists have also calculated that the Asian earthquake was significantly larger than initially thought. Teh-Ru Alex Song, at the California Institute of Technology in Pasadena, California, US, and colleagues used long-period waves from about 20 seismometers around the world to confirm that the earthquake was two to three times more powerful than magnitude 9.0 . But he says it is not clear yet how fast or slow the slip proceeded along the fault. The group arrived at their preliminary result on Sunday and will continue to refine their analysis. Song hopes seismologists will develop a technique to analyse and convey the magnitude of any earthquakes that could spawn tsunamis as they actually happen - information that could come from waves with periods of 200 to 500 seconds. "You need that kind of index so everybody around the world knows the magnitude and you can issue a tsunami warning to local people," he told New Scientist. The shift meridian in the Western Hemisphere ran southward from the North Pole, across eastern Quebec to Sidney, Nova Scotia, then through the western Atlantic Ocean east of Bermuda, to just east of Martinique (home of Mt. Pelée), to Manus, Brazil, to just west of Buenos Aires, to the Falkland Islands, to the tip of the Palmer Peninsula, and then to the South Pole. In the Eastern Hemisphere, the shift meridian ran northward from the South Pole across Wilkes Land in Antarctica to east of Perth, Australia, to Makasar, Indonesia, to just west of Manila, Taipei, and Shanghai and Mukden, China, and then through Siberia to Ust' Olenek and on to the North Pole. Note this exchange, as posted on a USGS web page for the Sumatra earthquake. Question: What effect did this earthquake have on the rotation of the earth?